Can you believe that summer is actually winding down to a close?! At least here in the northeast, August and the start of the new school year signals one last "official" summer weekend. With that being Labor Day. The sun decided to play games with me when I pulled out my gear to take these photos. Not only does the sun want to run away sooner in the day, but as I pulled out and set up all my gear, it decided to hide behind the clouds. Give me a break! But I pressed on, in hopes of catching what sunlight I could. I didn't want bright light because it completely washed out the warm peachy color of this dress and made it appear lighter than it really is. So I wanted more golden sunset lighting. Seriously though, I can't say what it was that I really ended up with, but it wasn't anything "golden." But my pup was in his car seat being super well behaved, so I took that as a sign to capture what images I could (is anyone else's dog more like a clingy fur child? No? Just me?... Oh...ok :-/). 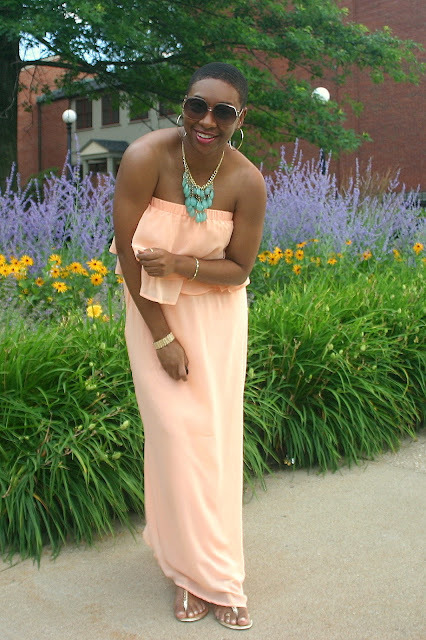 But about the dress - totes adorbs, right?! I found it during my trip to Puerto Rico last fall (where I had NO intention of shopping and was dragged to the mall against my will). And as soon as I saw this, I loved, loved, loved the soft summer peach shade. 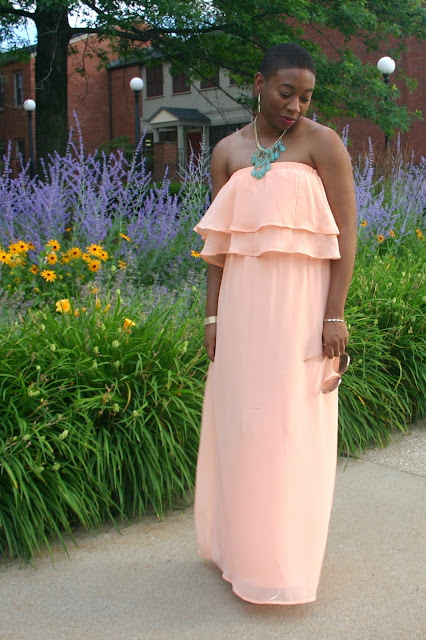 As much as I love shift and trapeze style dresses, I have a long spanning affection for maxi dresses. I do feel our summers here don't give me nearly enough opportunities to wear them as often as I'd like. Like this one, they are a great way to dress up in flats for a nice dinner on the patio or a quick way to look like you put in more effort than you really did when running errands. I would easily rock this to the grocery with oversized hoop earrings and toss on these same sandals or a basic metallic flip flop and I'm out the door. 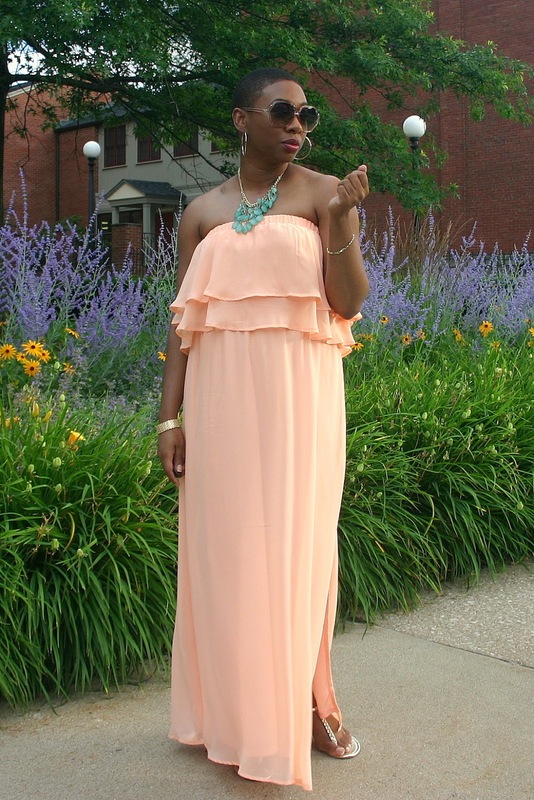 And, divas, let's not forget that maxis hide a multitude of things that we'd really like to hide. I would just suggest that if you're going to be with small children that still require picking up, don't go with a strapless dress like this, lessens the chance for an accidental peep show. If you're a more petite height your can still do a maxi length. It's an asset to find a great seamstress, but if you'd like to avoid that expense, I'm sure YouTube can show you tons of ways to hem a dress without needing a needle and thread (as seen here). 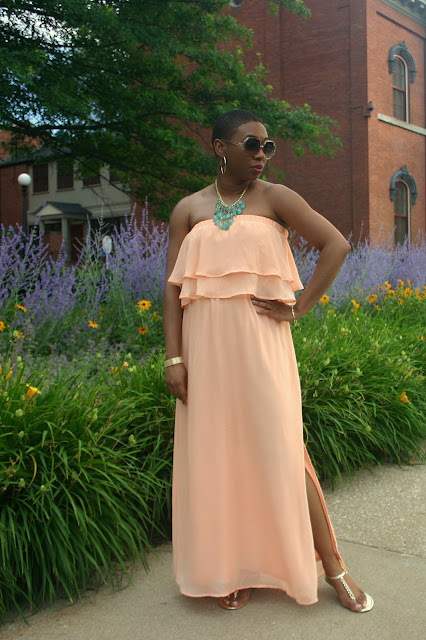 This post is also a part of Mix & Match Fashion's Summer Style Link Up!